As part of the Radiance class of ships, Royal Caribbean’s Jewel of the Seas is a vessel that allows the ocean itself to take center stage by offering sweeping panoramic views from all of the airy and light common areas. The amazing range of restaurants onboard include the Windjammer Café, the Seaview Café and the main dining room, not to mention specialty venues like Chops Grille Steakhouse, the Portofino Italian restaurant and for specialty coffees, the Café Latte-tudes. Royal Caribbean cruise ships are known for their onboard amenities and nothing sets them apart quite like the only rock climbing wall at sea. Royal Caribbean’s Jewel of the Seas has one, along with a jogging track, mini-golf course, a video arcade and a fitness center that offers classes in both yoga and Pilates. With a crew of 859, three pools, three whirlpools and the adults only Solarium, not to mention the views, and all the glass enclosed splendor you will quickly see why this is the ship of choice for so many cruisers. Royal Caribbean’s Jewel of the Seas currently is in service on many routes. You can take her on cruises from Boston to Canada on a 7 night excursion that stops in Halifax, Saint John, Bar Harbor and Portland, or you can take her on cruises from Puerto Rico for a 7-night jaunt into the Caribbean with stops in Philipsburg, St. Maarten, St. Kitts, St. Johns, St. Lucia and Barbados. For cheap cruises from Tampa FL, how about the 4 night trip with a stop in Cozumel to revitalize your senses? This cruise has many departure dates and starts at just $269pp. If you are looking for something different to do at sea, check out the ship’s Safari Club, home to the only self-levelling pool tables at sea. Royal Caribbean’s Jewel of the Seas also offers cruisers fine entertainment in the way of Broadway style shows, a Casino and many duty free shops right onboard, not to mention a selection of bars, clubs and lounges to suit every taste. 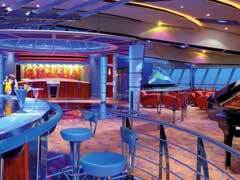 Royal Caribbean offers many Caribbean cruise deals for sailings throughout the year. Last minute deals and early booking deals may give you a great price for that dream cruise that you have always been going to take… one day. If you want a cruise that really showcases the ocean and all its splendor, then the Radiance Class from Royal Caribbean are the ones to choose. Not only will you see the ocean, but you will experience it like never before.